Nairobi’s informal settlements are characterized by marked overpopulation with poor water and waste management, resulting in a high incidence and prevalence of water- and sanitation-related diseases (Kandrava et al., 2007; Eisenstein, 2016). Nearly 30% of patients presenting at Access Afya facilities are treated for gastrointestinal infections, be they bacterial or protozoal. A significant number of patients are also treated for vector-borne diseases such as malaria. These infections typically require a microscopy component in their diagnosis, where causative organisms need to be correctly identified to guide appropriate treatment. Access Afya runs a mixed model of care to provide primary care services to residents of Nairobi’s informal settlements. This model includes typical brick-and-mortar clinics and pharmacies complemented by a field care program targeting factories, schools, and churches. A “hub and spoke” model is used in which each cluster is made up of a central laboratory with partner micro-clinics and pharmacies. The model is bolstered by a community health volunteer engagement program, which helps build stronger ties with the communities served and aims to bring healthcare closer to people wherever they are. Embracing innovations and digital healthcare solutions is also key to providing affordable and high-quality care to patients in the communities Access Afya serves. Recent years have seen the development of cheaper diagnostic aids for previously high-cost diagnostic services (Agoulmine, Ray, & Wu, 2012; Butcher, 2014). This has helped make diagnostic services more accessible, particularly in resource-limited settings and countries (Arasaratnam & Humphreys, 2014, Jarosławski & Saberwal, 2013). Access Afya evaluated microscopy services for possible optimization by leveraging digital microscopy solutions. Given the limited available physical space and the cost implications of having a light microscopy and trained laboratory technologist at each site, microscopy services are only available in the central laboratory, a practice recommended in resource-constrained settings where advanced tests are done in a central diagnostic hub with linkage to lower-level health centers (Elbireer, Opio, Brough, Jackson, & Manabe, 2011). Patient specimens requiring microscopy evaluation are transported by motorcycle couriers to the central laboratory. Once evaluated by the resident laboratory technologist through typical light microscopy, results are reported in the electronic medical record for the clinician to review with the patient back at the source site. A few challenges arose with this model. Occasionally, specimens were not prepared adequately for transport from the source facility. Damage or loss of samples would sometimes occur during transit to the central laboratory. Coordination issues also arose between facilities and couriers, involving delays between the collection and transport of specimens. Access Afya sought to reduce the time needed to report investigation results while minimizing the logistic and overhead costs of managing courier transport. Currently, all our facilities are in the same city, allowing the model to work reliably; patients can expect to receive results of their microscopy tests within several hours. As the network of facilities grows, we will need to maintain our ability to provide microscopy services efficiently and keep the turnaround time for results low. Microscopy is a powerful tool in medicine and biomedical research, as it enables investigation of the basic unit of life: the cell. Microscopes greatly enhance human vision by magnifying and resolving the margins of objects too small to detect with the naked eye. The typical light microscope used in a standard medical laboratory is a compound microscope, which utilizes an eyepiece lens and a set of objective lenses to achieve the magnification needed to visualize cellular elements. Magnification ranges from 40x to 400x for most light microscope setups. To work optimally, a light microscope must be used in a dust- and clutter-free environment, and its parts should be serviced regularly. A mounting stage to hold the specimen and a light source to adequately illuminate the specimen complete the setup. While microscope operation is generally simple, a user must have specialized training in microbiology, pathology, or medical laboratory sciences to glean diagnostically relevant information. Additionally, some specimen preparation procedures require advanced skills. Developments in technology and engineering have allowed the creation of alternatives to high-cost diagnostic devices. Such alternatives, collectively known as point-of-care (POC) diagnostics, have greatly enhanced the reach of quality diagnostics in the developing world. Access Afya has successfully implemented POC testing at clinics, pharmacies, and field locations. Antigen- or antibody-based strip tests allow Access Afya to provide rapid testing for 11 conditions in clinics and pharmacies. A partnership with the Boehringer Ingelheim Foundation allowed 11,000 people to be screened in the field for hypertension and diabetes using portable POC instruments (cellphone-based glucometers and blood pressure meters). A digital microscope has the same functions as a typical compound microscope. The key difference is that instead of looking at a specimen through the eyepiece, the digital microscope uses a digital camera to output a magnified image on a monitor (News Medical, n.d.). Such images can be shared, stored, and analyzed across digital platforms. Digital microscopy in medicine is not new. Telepathology, introduced a few decades ago, is based on digital sharing of information-rich pathology images to facilitate remote diagnostic consulting and teaching (Xiaodong, Bin, & Hong, 2011). 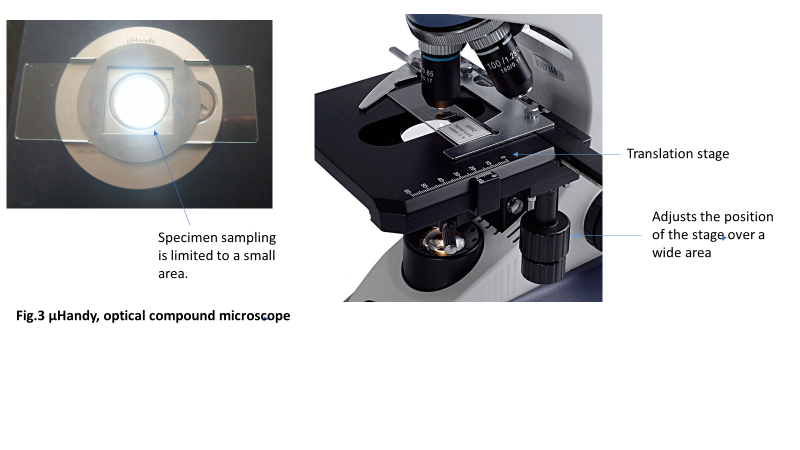 The microscopes used in telepathology are similar to conventional optical microscopes in terms of technological sophistication, and they too are usually housed in a core lab. However, portable designs exist that trade technological complexity for essential functions embedded in user-friendly and robust gadgets (Breslauer, Maamari, Switz, Lam, & Fletcher, 2009; Zhu, Isikman, Mudanyali, Greenbaum, & Ozcan, 2013). It was hypothesized that portable digital microscopes, because of their user-friendliness and ability to share images, would optimize the care delivery model in two ways. First, they would facilitate task shifting so that clinicians at every facility could prepare specimens and capture images to send to a remote lab technician for analysis. Distributing tasks that had previously been solely handled by laboratory technologists would increase the technologists’ work capacity. Second, digital microscopes would drastically improve efficiency through sharing images of specimens instead of physically transporting the specimens between locations. Image sharing also potentially allows for better quality control because these images can be stored for future reference. μHandy is a handheld digital microscope from Aidmics Biotechnology. The body of the device weighs 70 grams and incorporates an LED light source and a small battery. A detachable lens comes with the device. While in use, the lens is attached to a tablet or smartphone camera that outputs microscopic images onto its screen (Figure 1). μHandy was intended to be used for pre-college STEM education or personal exploration (Aidmics Biotechnology Co., Ltd., 2018). Its theoretical specifications, 30x–200x magnification with a 1-micron resolution limit, are comparable to the specifications used in traditional light microscopy. To evaluate μHandy’s performance against standard light microscopy, a laboratory technician was tasked to observe specimens with μHandy and with a traditional light microscope and to make diagnostic inferences. Stool and blood specimens were used for this. Stool specimens were emulsified with saline and apportioned onto a slide. Slides were observed first under the standard light microscope and then captured using μHandy hooked onto an iPhone’s digital camera. The appearance of samples under the microscope was described, noting the composition of the sample and the presence or absence of infectious life forms. Peripheral blood film analysis was done with Giemsa-Wright staining for the visualization of blood cell elements in blood samples. We evaluated μHandy’s diagnostic capability by measuring the consistency of observations between the slides as viewed with standard microscopy and with μHandy. The lab technologist’s self-described observations of stool specimens when imaged through each method were discordant (Table 1). In suspected infected stool samples, distinct ova and cysts of intestinal parasites (Entamoeba histolytica and Ascaris lumbricoides) could be detected with the light microscope but not with μHandy. In a follow-up test with blood samples, μHandy’s images showed distinct cells but with minimal subcellular detail. Pictured below, at 3x and 4x digital zoom (theoretical equivalents of 90x and 120x, assuming a total magnification of 30x from μHandy multiplied by the smartphone camera’s digital zoom), distinct round cells can be seen but with no further detail (Figure 2a). 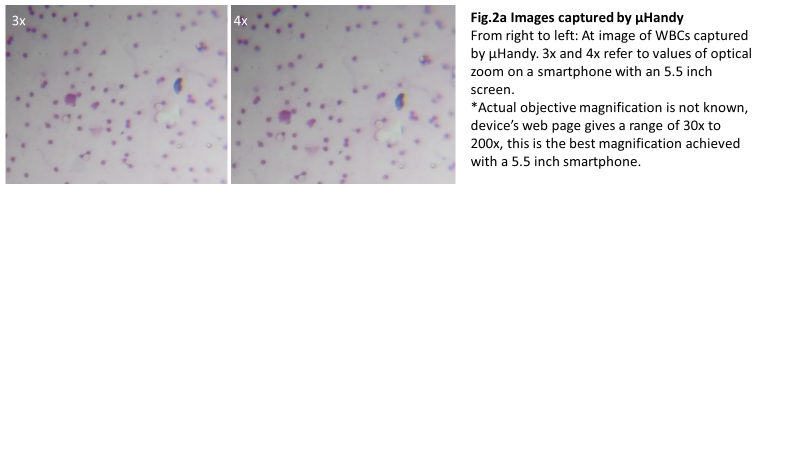 In comparison, at 40x and 100x, images of the peripheral blood films taken by the same smartphone camera used with μHandy (but by placing the camera to the eyepiece of the standard microscope) show greater detail. The multi-lobed morphology of a granulocyte (Figure 2b) is clearly resolved. Diagnostic accuracy is dependent upon adequate sampling of the specimen under observation. Standard optical microscopes have a translation stage (i.e., a stage capable of motion along the two axes of a plane). Changing the position of the stage brings different parts of the mounted slide into view (Figure 3). Thus, it is possible to scan an entire slide without re-orienting it on the stage if using the standard microscope. μHandy does not have a translation stage; instead, the slide is placed on a rectangular trough on the body of the device and magnetically held in place by a thin disk (Figure 1). The field of view is bound by the transparent center of the disk (Figure 3); thus, sampling is restricted to a much smaller area than the stage of a compound microscope. This limitation hampers the device’s diagnostic accuracy. There is a higher chance of reporting false negative results when features indicative of a positive diagnosis are left uncaptured, which may render μHandy ineffective as a diagnostic tool. 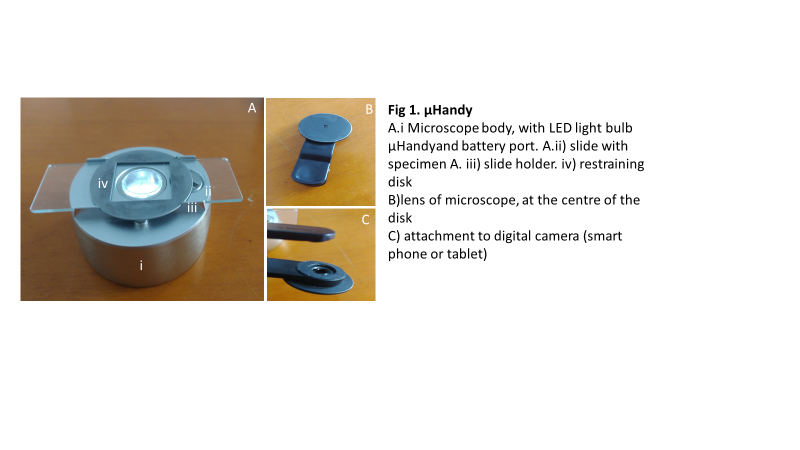 Access Afya’s trial with μHandy offers some important insights on optimizing the design of a portable microscope for clinic use. First, the specifications (magnification and resolving power) of potential devices need to be as good as or better than conventional microscopy, theoretically and in practice. We found that the high magnification values of μHandy were, in practice, comparable to lower values in standard microscopy. This could be explained by the expected variance of image quality with the size of the monitor and quality of the digital camera used (Kimura, 2005). Second, the design of the microscope should incorporate mechanisms to allow scanning of an entire slide. This ensures diagnostic conclusions are based on a comprehensive examination of patient samples. A different portable digital microscope developed by Richard Bowman’s lab at Cambridge University presents a compelling example of an imaging platform customized for specialized usage (Sharkey et al., 2016). It has a translation stage capable of precise sub-micron displacements without loss of focus or drift in unwanted axes. 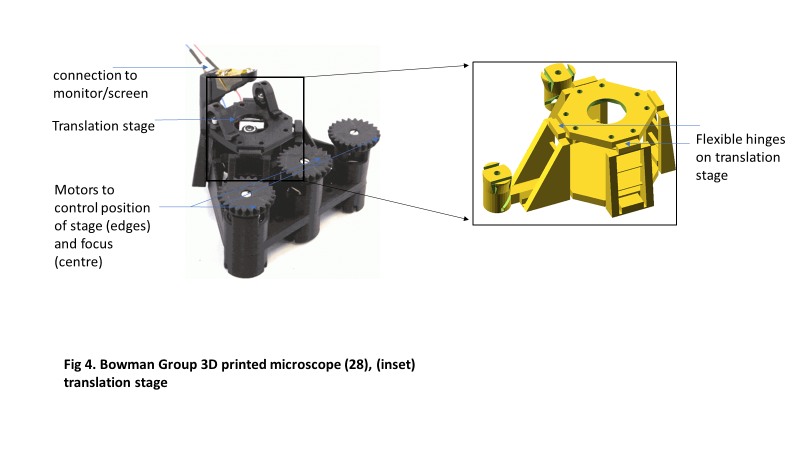 Both the stage and microscope are 3D-printed using plastic from open-source software (“OpenSCAD,” n.d.). The group exploited plastic’s flexibility to design a stage consisting of a parallelogram-shaped structure with flexible corners. Displacement occurs when the corners are bent in an arc, resulting in linear motion at the center of the parallelogram’s top plane (Figure 4). They report that motion in unintended axes is very minimal: less than 10 microns over five days (Sharkey, Foo, Kabla, Baumberg, & Bowman, 2016). Precise control of the specimen’s positioning and displacement during microscopic observation is important in research. Bowman’s group made such precision accessible in a compact design with 3D-printed parts (Sharkey et al., 2016). The microscope is expected to be useful for making time-lapse observations, especially where size and weight are under strict control or where disposability of the imaging device after use is desired. Dr. Bowman’s microscope design has important applications outside the laboratory. WaterScope, a water testing social enterprise with operations in developing countries, uses Bowman’s design to quantify bacteria in water samples incubated from water sources (WaterScope Ltd., 2018). The translation stage, in conjunction with image recognition facilitated by the microscope’s record of digital images, makes counting of distinct bacterial colonies possible. In Tanzania, the 3D-printed microscope is in trials for use in malaria diagnosis (University of Bath, n.d.). A translation stage capable of sub-micron displacement would work well for our purposes. It would be interesting to compare the resolving power of the Bowman design with that of clinical light microscopy. Comparing μHandy and Bowman’s scope, the outlook for portable digital microscopy in clinical usage is bright. μHandy’s limited capacity for specimen sampling is addressed in Dr. Bowman’s 3D-printed flexure translation stage. It seems that it is possible for these handheld devices to be used in the clinic if they are designed with specific requirements for medical imaging in mind. In the developing world, where demand for skilled labor in healthcare greatly exceeds supply, the focus is on effective task shifting to maximize the reach of available resources. Portable digital microscopy is set to introduce new possibilities in task shifting. Conventionally, the entire workflow of microscopy, sample preparation, observation, and analysis is the purview of a trained technologist. With POC-oriented microscopes, where applicable, clinical officers and assistants could potentially do all the work to create digital microscopic images. Laboratory technologists could work on an “on-call” basis, as is the case in telepathology, to remotely analyze electronically shared images of patient samples (Suhanic, Crandall, & Pennefather, 2009). Agoulmine, N., Ray, P., & Wu, T.-H. (2012). Efficient and cost-effective communications in ubiquitous healthcare: Wireless sensors, devices and solutions [Guest editorial]. IEEE Communications Magazine, 50(5), 90–91. Arasaratnam, A., & and Humphreys, G. (2013). Emerging economies drive frugal innovation. Bulletin of the World Health Organization, 91(1), 6. Breslauer, D. N., Maamari, R. N., Switz, N. A., Lam, W. A., & Fletcher, D. A. (2009). Mobile phone based clinical microscopy for global health applications. PLoS ONE, 4(7), e6320. Butcher, L. (2014). 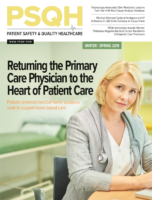 Physician leaders lower costs through care redesign. Physician Executive, 40(4), 14–18. Eisenstein, M. (2016). Poverty and pathogens: The growth of slums in the developing world’s rapidly expanding cities is creating new opportunities for infectious disease to flourish and spread. Nature, 531(7594), S61–S63. Elbireer, A. M., Opio, A. A., Brough, R. L., Jackson, J. B., & Manabe, Y. C. (2011). Strengthening public laboratory service in sub-Saharan Africa: Uganda case study. Laboratory Medicine, 42(12), 719–725. Jarosławski, S., & Saberwal, G. (2013). Case studies of innovative medical device companies from India: Barriers and enablers to development. BMC Health Services Research, 13, 199. Kandrava, K., Svabova, V., Bartkovjak, M., Kutna, K., Kolenova, A., Krumpolcova, M. … Kisac, P. (2007). P1244 Point prevalence study of the spectrum of infectious diseases and antimicrobial drugs use in homogeneous slum population of Mukuru in Nairobi. International Journal of Antimicrobial Agents, 29(Supplement 2), S342. Suhanic, W., Crandall, I., & Pennefather, P. (2009). An informatics model for guiding assembly of telemicrobiology workstations for malaria collaborative diagnostics using commodity products and open-source software. Malaria Journal, 8(1), 164. Xiaodong, C., Bin, Z., & Hong, L. (2011). Optical and digital microscopic imaging techniques and applications in pathology. Analytical Cellular Pathology, 34(1), 5–18. Zhu, H., Isikman, S. O., Mudanyali, O., Greenbaum, A., & Ozcan, A. (2013). Optical imaging techniques for point-of-care diagnostics. Lab Chip, 13(1), 51–67.